Contract for a self employed person engaged in any kind of work. Emphasises his self employed status. 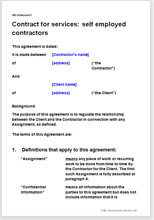 For thousands of self employed people this document will be presented to a new client as “my contract”. For any business using self employed people it provides the essential starting point for the relationship. Is this the contractors only work or does he work for others too? Does the client control how the work is done? Are the hours fixed by the client or can the contractor choose when he works? Does the contractor work on the clients premises, using the client's equipment? To what extent is the contractor at risk as a self employed person? Is self employment normal for this kind of work? A business using self employed people.